Dinosaur Comics - March 30th, 2018 - awesome fun times! –A "mirror" universe, if you will! March 30th, 2018: Shout out to my new physicist friend Daniel for shooting me an email covering most of this, after yesterday's comic! 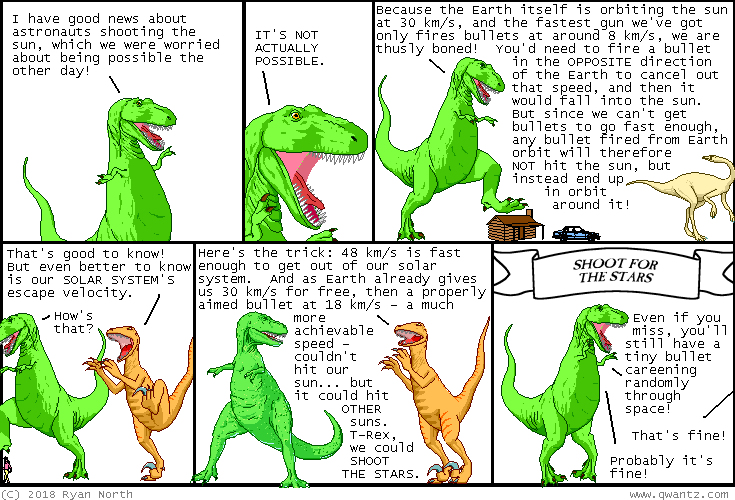 This is basically the Dinosaur Comics version of his email, and I was thrilled to learn more about The Physics Of Shooting The Sun. If we work together, one day we can do it. Thank you Daniel, and to everyone else who emailed me with corrections too!